Anthony Horowitz’s prequel to Ian Fleming’s Casino Royale, Forever and a Day (2018) starts with M making the observation, ‘So, 007 is dead.’ Of course it isn’t James Bond who is deceased but the unnamed previous incumbent with that Double-O number. A neat touch, that. Where the earlier book took place in 1957, shortly after Goldfinger, this one takes us to early 1950s, the beginning of Bond’s career as the new 007; there are only three Double-O men – 008, 0011 and 007, it seems; M deplored using sequential numbers (p4). M’s Chief of Staff reveals that 007 was murdered in the south of France, in Marseille. He’d been investigating the Corsican underworld in the area. ‘It seems that there was a woman involved.’ To which M replies, ‘There always is.’ Dry humour, just the right note. The woman is called Madame 16 or Sixtine, a one-time worker at Bletchley Park and subsequently an agent in SOE. As 008 was still out of action (hospitalised) and 0011 was in Miami, it was deemed necessary to send the new 007 to dig around – James Bond. Eventually, Bond finds himself in Monte Carlo, playing Vingt-et-un against Sixtine. An amusing aside when a croupier mutters, among other appropriate phrases, Carré, doubtless Horowitz’s nod to John Le Carré. (p59) This scene is also an homage to Fleming’s lengthy discourse in Casino Royale. There are two villains, Scipio a grossly overweight Corsican and rich industrialist Irwin Wolfe. Scipio delivers Bond a trenchant speech via a translator: ‘… the arrogance of the British. You are a tiny island with bad weather and bad food also but you still think you rule the world… you are becoming irrelevant…’ (104) Maybe he was an early scriptwriter for the EU negotiators? Inevitably, Bond is faced with grim ‘torture’, which is only to be expected. However, more than once he seems to escape through no guile of his own; I won’t say more. This didn’t spoil the book for me; I perhaps was hoping for more, which may be my failing. Horowitz also adopts the Fleming style of chapter headings, often playing with words, among them Killing by Numbers, Russian Roulette, Not So Joliette, Shame Lady, Love in a Warm Climate, Pleasure… or Pain? and Death at Sunset. 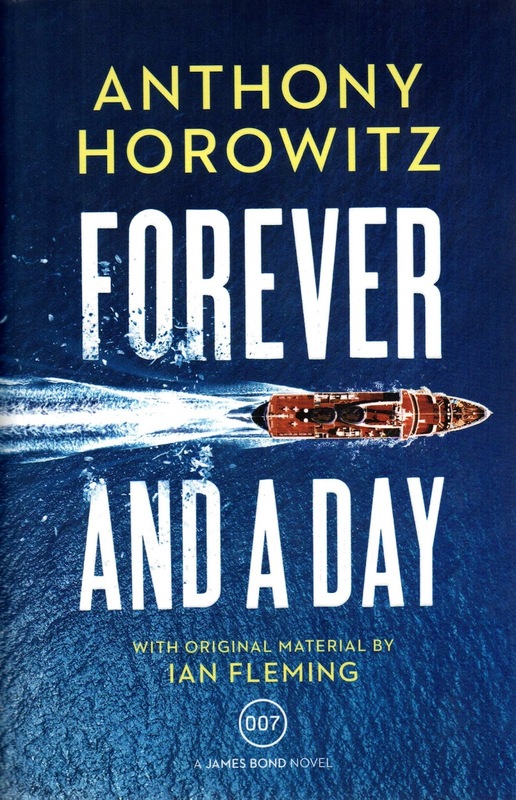 I wasn’t impressed by the title, Forever and a Day, but it makes complete sense now that I’ve read the book. It’s also the title of a 1943 film. The cover is excellent, the luxury yacht resembling a deadly bullet! 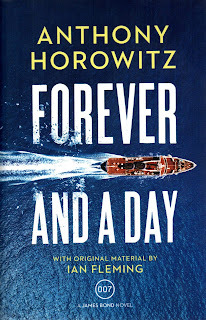 I ended my review of Trigger Mortis with the hope of seeing another Horowitz 007 novel, and despite a few caveats he has not disappointed. I look forward to the next. Clumsy wording: ‘Bond was holding the envelope that he had found in his right hand.’ (p49) At the bottom of p48 we know Bond is holding an envelope which he’d just found. Had he just found it in his right hand? ‘Then he slumped to the ground.’ (p49) This is in an apartment, so it should be ‘floor’ not ‘ground’. ‘… punctuated by a slither of silver moonlight.’ (p144) I’d reckon that should be ‘sliver’. Consistency. At one point we have eyeglasses (p103), and at another spectacles (p54). As Bond is ex-Royal Navy, and it’s mostly his point of view, when he’s aboard Wolfe’s luxurious vessel, he wouldn’t note ‘submarine-style hatches’ but simply hatches. (p140). Again, ‘the letter R was printed on the wall one floor down.’ (243) But these are bulkheads and decks, even if in a luxury ship! 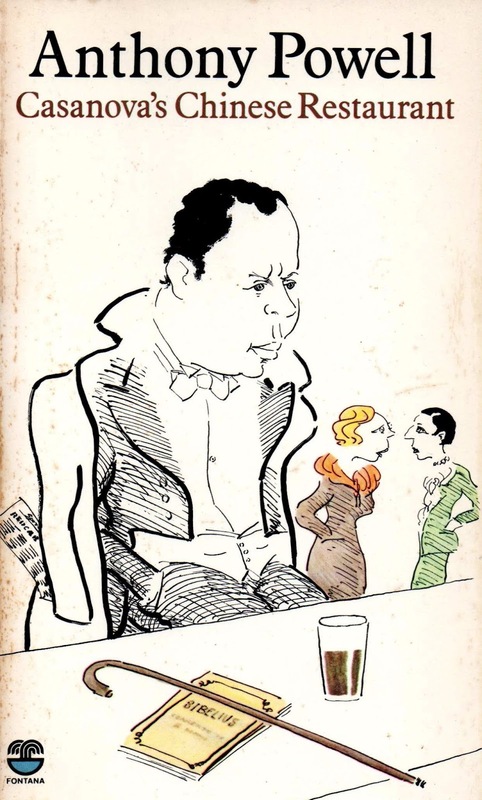 The first four volumes of A Dance to the Music of Time are reviewed in earlier blogs. 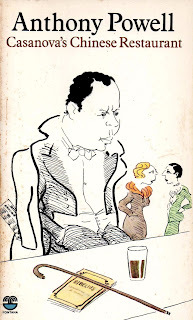 Anthony Powell’s 1960 novel Casanova’s Chinese Restaurant begins in the late 1920s and is again narrated by Nick Jenkins, and reveals in flashback his first meetings with Mr Deacon (deceased in the previous book), Maclintick, Gossage, Carolo and Moreland. As before, there is little emotion in the narrative: ‘I listened to what was being said without feeling…’ (p29) – which could apply to the story so far, really. Powell’s narrator doesn’t involve the reader greatly in the scenes: ‘Maclintick and Barnby ordered something unadventurous from the dishes available; under Moreland’s guidance, I embarked upon one of the specialities of the house.’ (p34) You have to wonder if Powell could actually name any Chinese dishes; and the phrase ‘from the dishes available’ seems superfluous, as would ‘from the menu’. Following from these reminiscences, we move to the 1930s and Nick reveals he has been married to Isobel, ‘perhaps a year’. (p58) The scandal about Mrs Simpson and, ultimately, The Abdication, is the talk of the town. There is a rare stab of emotion, however: ‘I suddenly felt horribly uncomfortable, as if ice-cold waer were dripping very gently, very slowly down my spine…’ (p151) when reminded of his old love Priscilla. At the nursing home he meets Moreland and, of all people, Widmerpool. Here, Nick reveals to Moreland, an expectant father, that Isobel has just had a miscarriage. Moreland is not particularly sympathetic, bemoaning the fact that his wife Matilda’s constant false alarms were likely to make him bankrupt. (p98) These were the days before the National Health Service. There’s a preponderance of names beginning with the letter ‘M’ – Moreland, Maclintick, Mona, Members, Milly, Magnus, Mildred (dumped girlfriend of Widmerpool), Mortimer, Matilda ( wife of Moreland)… Reminds me of the story ‘The Empty House’ in The Return of Sherlock Holmes: ‘My collection of M’s is a fine one…’ (p20) Though perhaps in this book’s case there’s an overabundance of names beginning with that letter. Next: 6 – The Kindly Ones.